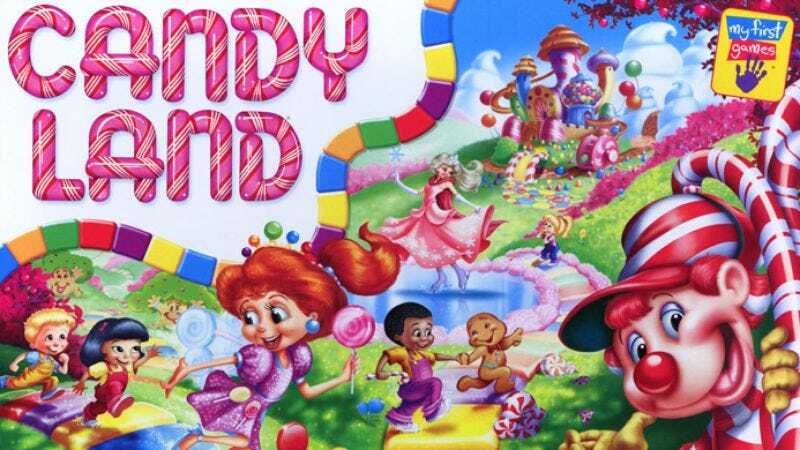 Should you be concerned that Universal’s previously announced, forthcoming live-action adaptation of Hasbro’s Candy Land—the film based on the beloved children’s clause in an overall development deal—played its only hubris card on its first turn, cease being concerned immediately. Alvin And The Chipmunks: The Squeakquel and Kung Fu Panda 2 writers Jonathan Aibel and Glenn Berger took over the project for Tropic Thunder’s Etan Cohen a while back, and they’ve since set about lending some much-needed gravitas to the story of Gramma Nutt, Mr. Mint, et al. First up: An overly ambitious statement such as “We envision it as Lord Of The Rings, but set in a world of candy,” which is what the duo told Entertainment Weekly yesterday, hopefully while making a frame with their fingers and peering through it very seriously. And indeed, according to Berger, there are many parallels between Tolkien’s rich mythology and Candy Land’s play patterns based on basic color recognition, and the two plan to tease out those similarities by telling a story of the epic battles that fell like a long shadow over this land of candy, from the sugary slopes of Gum Drop Mountain to the sticky thickets of the Candy Cane Forest—a subtext that may have escaped your attention when you were but a wee toddler trying to shove a plastic gingerbread man up your nose. “We are going for real comedy, real action, and real emotions at stake,” Berger really avowed about this real movie he really planned to make, before returning to the very real obligation of having to make all of that stuff really happen now.